It seems that so far this year I have worked as much as, if not more, on other people’s layouts as much as my own. So, in no particular chronological order, here are some of my recent antics. During the month of June and the first part of July, I was on extended business travel to Indianapolis. Dave Vaughn (more on Dave later) hooked me up with his friend and fellow NKP modeler, Jim Canter. Jim belongs to a jolly bunch of O scale/P48 aficionados who have an informal rotating club that meets at and works on the member’s layouts. So I got to do things as varied as installing a transfer table on a 3-rail layout and doing general DCC, electrical and urban construction duties on a portable P48 layout that Jim is building. I also learned something amazing – Lionel invented P48! Here’s a video to prove it (you may have to view the video in full screen mode, on the playbar, to see the video in the proper aspect ratio). All kidding aside, I enjoyed my time among the P48’ers; but, no, I’m not changing gauge! The highlight of my time in Indianapolis was the time spent working on Jim’s portable P48 layout. This layout is 8’ x 16’ (4’ x 8’ equivalent in HO) and disassembles into 4 sections for transport. The track plan is one of the best that I have seen for this space incorporating a continuous run, a runaround/passing track, several industries that can be switched without interfering with the continuous running, a short stretch of 2-track “mainline” where big locos can shuttle back and forth plus a cosmetic junction with the mainline featuring dual sets of diamonds. It is possible to keep 3 trains in motion on the layout, although two of them are shuttling back and forth. All track on this layout is hand laid with tie plates and four spikes per tie, code 125 rail. I helped Jim lay out his urban scene at one end of the layout, built foundations for the Woodland Scenics/Menard’s buildings; did the DCC system and decoder setup and generally made myself useful. The last week that I was there was the week before the NMRA National Train Show, which Jim had committed to attend with the layout. There was a lot of work yet to do and I worked every night that week to help out. On the Sunday before the show a whole gaggle of people, including Dave Vaughn who was in town for business on Monday, were ballasting and putting down ground cover. The stars aligned for me the next weekend (July 19-20) and I was able to make a blitz trip to Cleveland and attend the NMRA National Train Show. On Saturday I handled the duty of keeping all of the trains moving, which was not as boring as it sounds. 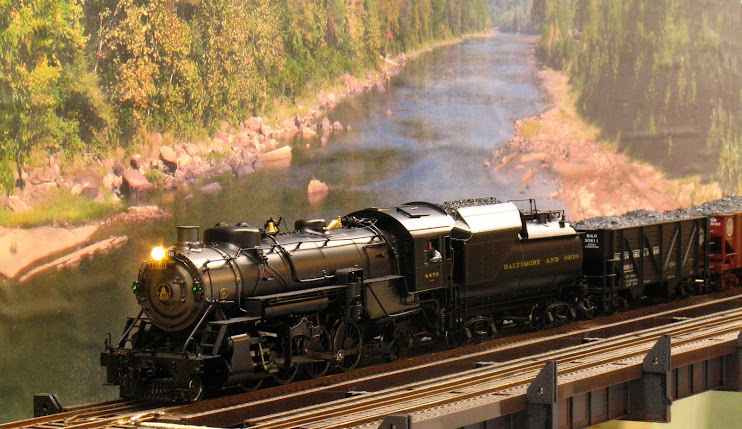 Interest in the layout was very high, not necessarily from the general public, but from other modelers who had not considered O scale as a viable option before. From talking with a lot of modelers in every scale from N to G the layout struck a cord because of: modest trains running at realistic speeds; accommodation of both continuous running and switching; a plausible mix of urban and industrial/rural scenes; beautifully done track work including #10 and # 8 switches exclusively and a modest size that can fit into a single car garage space. Many NMRA officials spent time at the layout and want to have it at the 2016 NMRA National which will be held in the layout’s hometown of Indianapolis. All of this and the layout is not even near complete yet! Here’s some video that I shot of the layout to give you a feel for it. I guess that I’ve been adopted by the Indianapolis group and, since I expect to be making periodic business trips to Indy, that is a good thing! Going back to the last week of March, the week before I started my new job, I helped Dave Vaughn prepare his layout for a photo shoot by Great Model Railroads. I worked on John Armstrong’s “Photographer’s Bend” scene and the extension of it that Dave had built. The extension, mated with Armstrong’s original work, makes it into a long, lazy “S” curve. Dave had molds made of Armstrong’s rocks and castings matching the original rocks which were used in the new scene. The new work had no ground cover to hide the plywood baseboard, so that’s where I started to work. Woodland Scenics/Scenic Express ground covers were used. The only thing unusual that I did was use natural rock that I had collected, cleaned and screened. ‘Ya gotta love O scale, since it large enough that natural scenery materials are easy to use, because nothing offered commercially today beats natural materials where you can use them. Armstrong's original section extends to the bridge in the foreground. One thing I did do was add some talus to the base of Armstrong's cliffs. I did not have the privilege of knowing John Armstrong like some of the other guys in our group did, but I have been honored to work on his layout. Finally between business trips I’ve been trying to finish the backdrops on my own layout and I’m almost there. They’re more than 75% done now and I going to halt here and clean up the layout for my twice-postponed open house. With most of the backdrops done, scenery can begin even though the mainline is not finished; and I’m looking forward to it.